One day BABA JI asked S. Rattan Singh of Kaleran village (located a mile from Nanaksar Thath) to select a place where he can stay for a few days. BABA JI said that the place should be an open one, which should not have a road nearby and the area must be dry. S. Rattan Singh replied that such a place is “KARRARI KA THEH”. This place was surrounded by the boundaries of three villages (Galib Kalan, Galib Khurd, and Sherpura). Here a “Mathh” was erected in the memory of a childless, unmarried girl of the mahajans (karrarr); the people were emotionally attached to this place. Dhan Baba Ji refused to stay at this place. 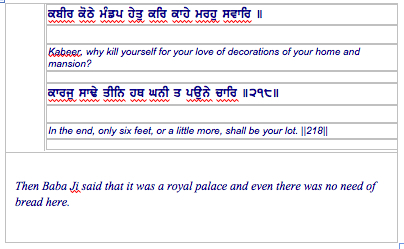 This led the followers to tell about a place near Gujran Di Patti, but again Dhan Baba Ji declined to stay there. Then Baba Ji himself pointed to a place, where there was a well. This place belonged to Agwar Lopo of Jagraon. Baba Ji then brought a horse and road it to the newly discovered place, and his followers took spades and karahis and followed Baba Ji. The land was full of ant holes and recently diseased animal carcasses were scattered throughout the land. Snake holes were seen everywhere, and people began to suspect that this land was a place of ghosts. The herds of deer ran hither and thither. The wild cows ran amuck and at night wolves would howl for hours. Nearby, there was a deserted well. They took some water out of it, but it was black in color. The followers drank some of it, and described it as being bitter like poison. But Baba Ji said that the water was good and ordered to take some buckets of water out of it, which prompted the villagers to immediately withdraw water. Suddenly, the water became very sweet and pure. Baba Ji did not want to move to another place even though it may be near a road. Baba Ji liked this place and decided to stay here. What was the real reason to select this place? About a mile from this place is the historical gurdwara of Gurusar, where SAHIB SRI GURU HARGOBIND SINGH JI stayed there for some time. GURU SAHIB used to hunt in the forest there and GURU SAHIB himself took water from that well. The ANTARJAMI BABA JI selected this place for that special reason. The villagers dug a deep pit about six feet in length and built a boundary wall about six feet high made of katcha (bricks). It was covered by local grass.